Mix the Horchata powder mix envelope with the one quart of your choice of milk. Sweeten to taste. Pour in an 8 oz glass half filled with crushed ice, top the drink with Cinnamon sugar poured over ice. Soak 2 cups of rice in water for a half hour add a teaspoon of cinnamon and blend (in blender) empty into a pitcher (with all the little sand like rice that's in there it's the flavor of the drink), add a can of evaporated milk, fill with water and add sugar to taste. 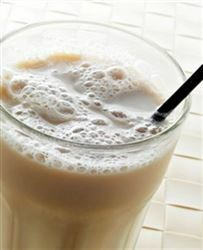 THAT IS AUTHENTIC HORCHATA!!! Enjoy this delicious horchata Mexican food recipe!